"I said [before] ... if the global stock [market] is going to take out the low and put in a new low, something bad must be happening. I don't think the U.S. can hold in there," he said Thursday on CNBC's "Fast Money Halftime Report." The bond investor noted the S&P 500 was strangely outperforming the rest of the world's equity markets since the summer into this month. "I said [before] ... if the global stock [market] is going to take out the low and put in a new low, something bad must be happening. I don't think the U.S. can hold in there," he said Thursday on CNBC's "Fast Money Halftime Report." "Well what happened as rates broke to the upside ... the global stock market ex-U.S. did take a new leg down and did go to a 12-month low. And it's interesting the S&P 500 did what I said. ... That is join the global stock market on the way down." On Wednesday, the Dow Jones Industrial Average declined by more than 800 points and the S&P 500 fell by 3.3 percent as investors worried about the negative effects from the rising interest rate environment . The sell-off came a day after the 10-year note yield traded above 3.25 percent hitting its highest level since 2011. This occurred about a week after Federal Reserve Chairman Jerome Powell said in an interview with PBS that the central bank is a "long way" from getting rates to neutral, which pointed to a possibly more aggressive path for rate hikes. 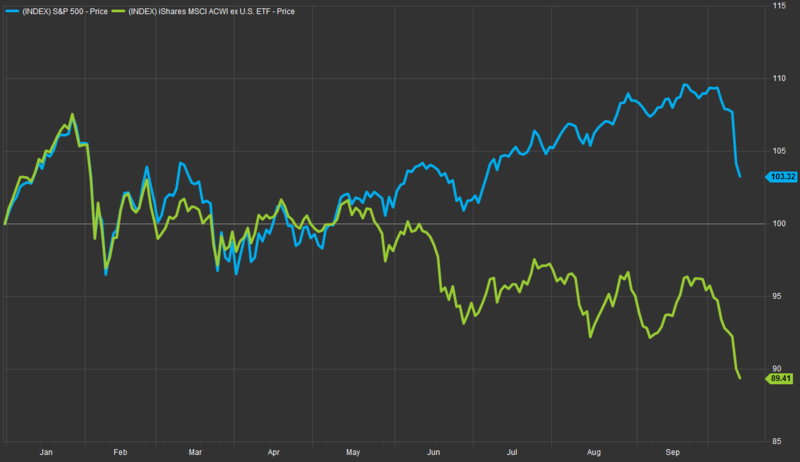 The iShares MSCI ACWI ex U.S. ETF, which tracks the performance of a rest of the world ex-U.S. equity index, is down 10 percent this year through Wednesday versus the S&P 500's 4 percent gain.